After hearing word yesterday that Adam would be discharged to Gaza there was a one day delay and so today was the day for Adam and Mom to return home! 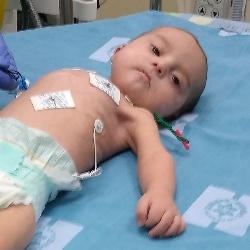 Adam’s heart is doing very well and the team at Hadassah released him to go back to his family with follow-up scheduled for next month. Adam’s mom had wonderful things to report about the staff at Hadassah and says they were so kind to her and Adam and did such a great job, she will be forever grateful. Adam’s mom also told me about how much she loves the workers at Shevet too. She had Diana and Svea with her on Adam’s surgery day and she told me how she was crying so much because she was overwhelmed and so anxious. But then Diana and Svea were with her and had her laughing and even almost forgot all her anxieties; she was recounting the story to me with a smile on her face and saying how she loves Diana and Svea so much. Adam has three sisters and a brother back home that he and his mother have not seen for 5 weeks. 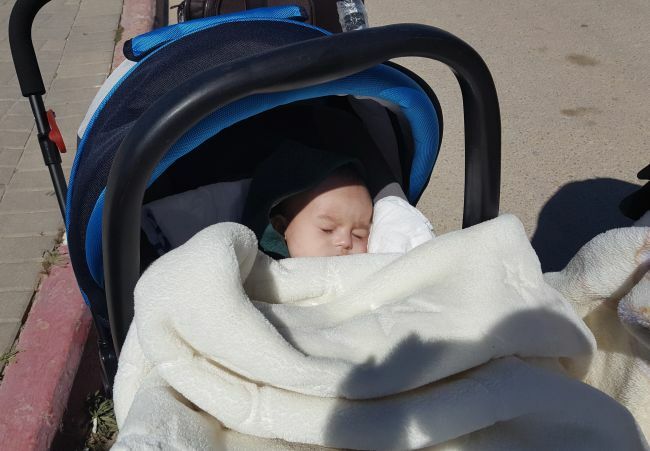 Adam was hospitalized for 2 weeks in Gaza before coming to Israel where he has been for the past 3 weeks. So, Adam’s mom is very excited to see her family! She was keeping her return home today a surprise for most of her family. She is so excited to see their faces when she unexpectedly opens the door. 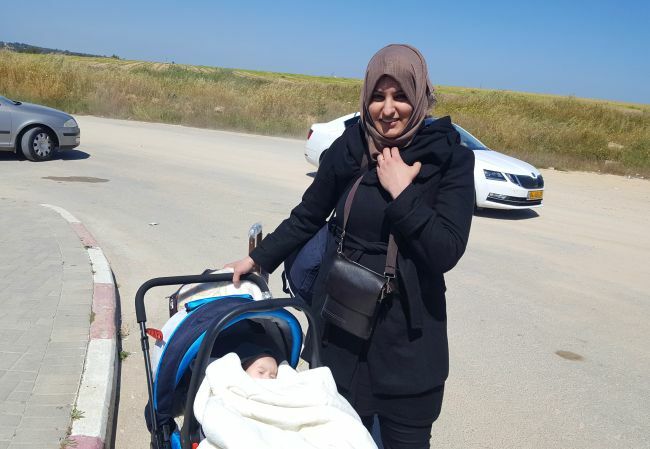 During our long 1.5 hour drive to the border crossing we were anxious for the time to soon be over so they could be reunited in Gaza with family! Luckily, the traffic was good and we enjoyed driving through the mountains which are lush and green during this season, it was a beautiful drive and a blessed time with Adam and Mom! Praise God for all He has done and is doing with sweet little Adam. We look forward to seeing them for Adam’s follow-up in Israel soon! 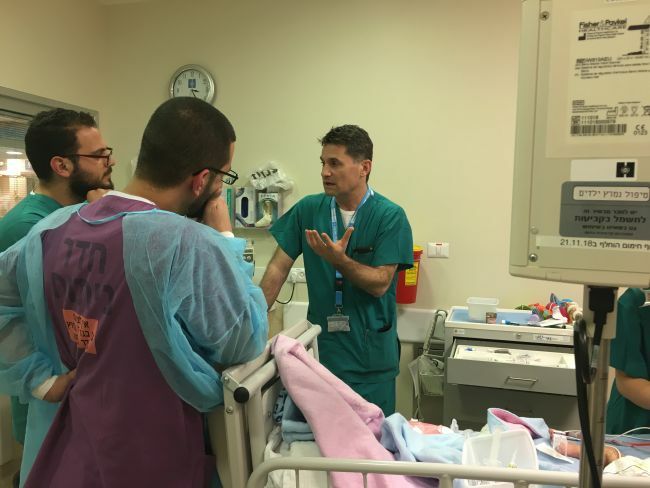 Today, we had the privilege and honor to go to Hadassah hospital in Jerusalem for very first time. On the way, we were a little anxious if everything will go well, because we didn’t know where to go exactly and only knew the name of the baby that was waiting for us. But then, we arrived very smooth at this beautiful hospital and also easily found the Pediatric Cardiac Critical Care Unit. And on top of that, the first person, we saw, was our precious friend Dr. Uri! So we took a breathe, knowing that for now on we are on the right, safe place. It felt like home! It was very nice to see him again, but the most exciting part was seeing Adams mother. When we went into Adam’s room for the first time, it was empty. He has already been in surgery and his mom wasn’t there. When we found her, we tried to speak Arabic with her. Speaking only poor Arabic it’s every time interesting to connect. But praise the Lord, she could speak English really well! That facilitated so much and we spent such an amazing and special time together. Of course, she was deeply worried about her beautiful baby. He nearly died in Gaza and all her hope to save his life roots in this surgery. But, we think that like us she enjoyed our time together. We laughed a lot and also we ate lunch she shared with us. After about 5 hours waiting with her, all of a sudden our beautiful Adam came out of the surgery! Even though it was a complex treatment, the surgeon and the cardiologist were very pleased with the surgery: “Now his valves are perfect.” Praise God. If everything continues well, he is going to be extubated today or tomorrow. When we were going to say goodbye to his mother, she didn’t want us to leave. We hugged many times. It’s our hope to see both of them again, when Adam can smile and play with us. 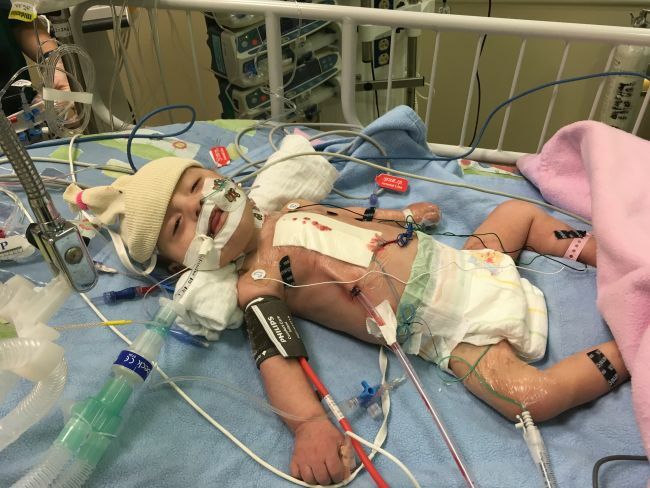 And it’s our prayer to thank God, to open new doors that babies like Adam have the opportunity the get their life saving surgery in times where Sheba and Wolfson hospital are completely full. Please pray for this beautiful baby and his caring and lovely mother. May he recover soon, experience complete healing and grow up to be a unique and beautiful boy. 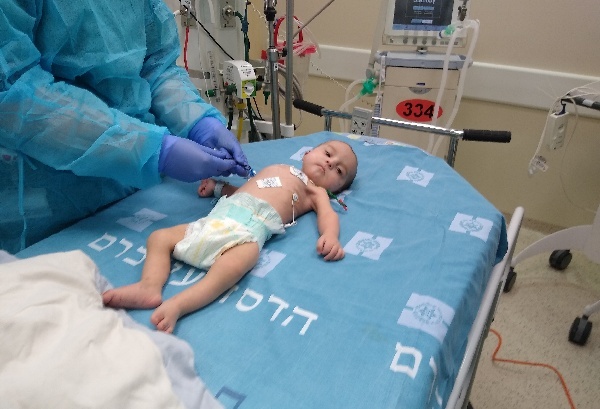 Four-month-old Adam was in congestive heart failure in Gaza, waiting day after day for space to open up in a hospital in Israel for his life-saving surgery. 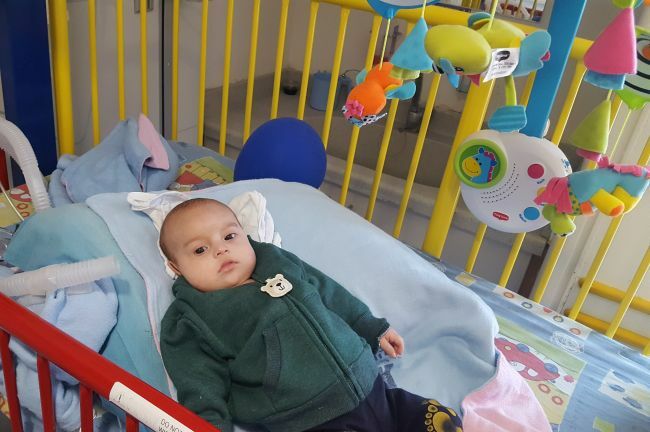 Finally Friday a bed was found for him in Hadassah Hospital’s new pediatric cardiac care center, where he is now awaiting surgery. As of right now, Adam still needs $5500 toward surgery and related expenses.